Yield: Yields about 1/2 cup. Slow-roasting whole heads of garlic with a drizzle of oil concentrates the flavors and adds a caramelized note that enhances garlic’s natural sweetness. Nutritional Sample Size based on 1 Tbs. Remove any loose papery skin from the heads of garlic, taking care to leave the heads intact and the cloves covered. Slice 1/2 inch off the top of each head to expose the cloves; discard the tops. Put the heads in the center of a large piece of aluminum foil and drizzle with the oil. 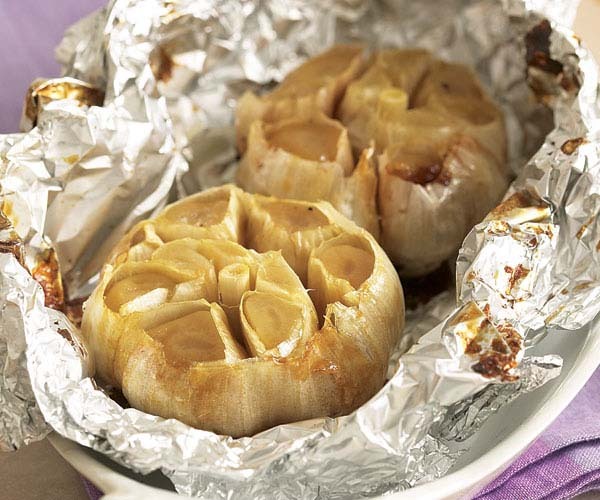 Gather the foil around the garlic in a pouch and put the pouch in a small baking dish (in case the oil leaks). Roast until the garlic is completely soft and golden brown, 70 to 80 minutes. Let cool briefly and then push the soft garlic from the skin. 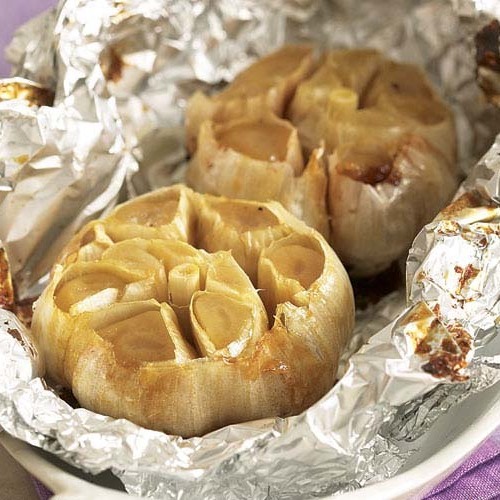 Stored in an airtight container in the refrigerator, roasted garlic will keep for a week. Stir into mashed potatoes or cooked vegetables. Use as a spread for sandwiches. For a delicious, quick appetizer, spread onto crackers topped with soft goat cheese and cherry tomato halves. Spread onto toasted baguette slices to make easy croutons for soup. Stir into the drippings from a roast for a savory gravy. Whisk into a vinaigrette to use on a hearty salad.